A: I am a Research Associate for the Baliga Lab, where I perform genome-wide experiments that feed into the complex, predictive software tools that we create here. One project I work on investigates how microbial communities respond to stressful environmental changes over time. It is challenging research: my model organism—Desulfovibrio vulgaris—is hard to grow at the bench. Desulfovibrio is anaerobic; it likes to grow in oxygen-poor environments such as soil sediments or gastrointestinal tracts, so all of my work has to be done with as little exposure to air as possible. Q: What is Pop-Up Science? A: Pop-Up Science (pop-upscience.com) is a pop-up museum dedicated to science, technology and creativity. We travel to all kinds of places—from coffeehouses to public parks and everywhere in between—to do workshops, live-demonstrations, and hands-on activities in places people don’t ordinarily expect to find science. We take a very community-focused approach when it comes to public programming. Our programs aim to break down academic, cultural, and geographical barriers that impede STEM learning, so much of the work we do is done with and within Seattle’s diverse neighborhoods. Q: What was the pop-up on the ferry and what inspired it? A: As a small, mobile museum, Pop-Up Science is a model built especially for taking risks. 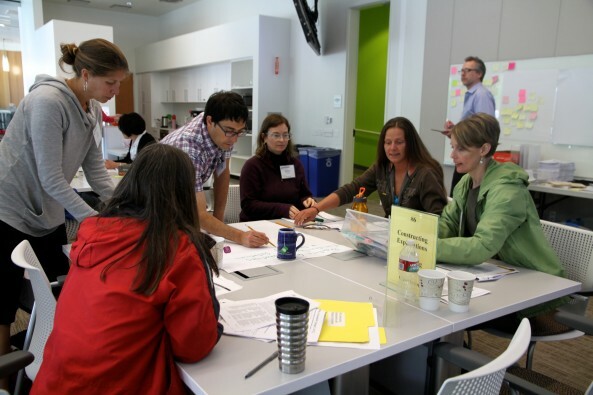 When we were thinking of new and different outreach models, we wanted to experiment with playful ways that bring scientists out into the public to provide strong examples of applied science that are Seattle-specific. So we came up with an idea for “Street Smarts”—a series of live, impromptu demonstrations (done by scientists) aimed at opening up “surprising scenes of science” for public interaction and discussion. In the Baliga Lab, we know how ocean acidification is affecting the ecosystem, economy, and culture of the Puget Sound, but not many are aware of the consequences. We wanted to drive home the importance of understanding ocean acidification by giving Seattle the opportunity to learn about it where it actually occurs—on the ocean. Turns out, Washington State Ferries works with local ecologists to gather data on water quality and particle movement. So we called them up, got their enthusiastic okay, and completely surprised ferry passengers for two hours with free hands-on activities on ocean acidification, marine food chains, and, of course, real oceanographers. Q: What got you interested in studying science museums around the world? A: ISB was my first real scientific community outside of college. Collaborating in multidisciplinary teams had a profound effect on how I understood contemporary research to work. But these values are not conveyed to the public today. Our society is still dominated by the idea that science that is an alienating and apathetic field. I became so obsessed about finding the perfect “21st Century Science Museum” that, in 2010, I left my job and started a graduate program that let me search full-time. There are a lot of different types of science museums out there. I think, to date, I’ve seen more than 80 science museums across the U.S., Scandinavia, U.K. and Ireland. Q: What advice would you give to young people on how to stay curious about science? A: Science is always changing, which means that you should never limit yourself to what you think you’re interested in. The people who work in science today are multitalented: they like to work with people; they have many different interests and skills. I think many teachers and counselors will try and tell you that your scientific future is linear and often lies in one discipline. But really, to be successful in STEM today, I’ve learned about having the drive to think and work across academic boundaries, and being comfortable with the paths you might take to get there.